Was Carlos Mejía a Target? On the evening of Friday, April 11, Carlos Mejía Orellana, 35, was stabbed to death in his home in El Progreso, Honduras. The white Rosary his mother had given him that day was broken and on the floor of the living room of his home. Nothing of value was taken from house. His well maintained Toyota sedan sat on the carport, its alarm sounding. Why was Carlos murdered? Was he targeted for his work at Radio Progreso? Carlos was the eldest of 11 children to parents Salvadora and Nicolas. The family moved from a rural area near Ocotepeque to the growing northern city of El Progreso when Carlos was 8 or 9. He was entrepreneurial man, an intelligent and diligent worker who began at the Jesuit radio station Radio Progreso in his early twenties, and eventually became promotion and marketing manager. He was quiet and thoughtful, and knew how to get things done. He seemed to anticipate your needs before you knew you had them. His house was well constructed and secure. He paid attention to issues of security. The home had a high wall surrounding it, with strong gates and tightly coiled barbed wire. He had a boyfriend, but lived alone, with two socialized and friendly dogs; they were not part of the security plan. He adored them and spoiled them. They were companions. His work at the radio station took him into the community. While shy in social settings, Carlos was not shy about the radio station. He loved his work selling ads and producing events promoting the station. He also had other jobs outside the radio station, all approved by his supervisor, Catholic priest Ismael Moreno, known as Padre Melo. Carlos had taught management classes, and recently was helping a community radio station get off the ground. He had just purchased a washing machine for his parents. It was still wrapped in plastic on in the carport the day I visited. Carlos Mejia was one of 16 members of the Radio Progreso team granted protected measures by the Inter-American Commission on Human Rights. Station employees had received threats of violence, and many journalist colleagues in Honduras have been murdered. Radio Progreso studios were occupied by the armed forces during the 2009 coup, and the station was surrounded by police on another occasion. In a country with so many layers of corruption, militarization, violence and impunity, Radio Progreso, and its affiliated Jesuit research team ERIC (equípo de reflección, investigación y comunicación) are an irrepressible daily affirmation of freedom of expression, creativity and courage in Honduras. Their work confronts and directly challenges the corruption and impunity. Was Carlos targeted because of his work at the Jesuit radio? At this point one can only speculate. He was murdered at his home, stabbed several times with a knife. It appears his body was posed. It appears the killer or killers removed his clothes and tried to create the illusion of another kind of murder. But the shirt he was wearing that night was never found. Someone took it. Someone took the knife. Someone left by the front door and the front gate, leaving them both open. It appears Carlos’ attacker came to the house with him, perhaps in Carlos’ car. They ate chicken, and shortly after Carlos was attacked–perhaps initially in the living room where the Rosary was broken, and then murdered in the bedroom where his clothes were then removed. As the marketing manager, Carlos’ work provided the financial capital for the radio. His death has been a huge blow to his coworkers and a direct hit against the radio station economically. As a gay man, his killer or killers may have considered his sexual orientation a vulnerability to exploit. Someone gained Carlos’ trust enough to be invited to his home, and murdered him. In an immediate newspaper online account, police declared their suspicions of a crime of passion before they had conducted any investigation. No one has ever investigated the many threats against the radio station staff and management that began in earnest in 2010 and remain as permanent threats. On April 18, U.S. Representatives James P. McGovern (MA), Sam Farr (CA), and Janice D. Schakowsky (IL) released the following statement on the murder in Honduras of Carlos Mejía Orellana. 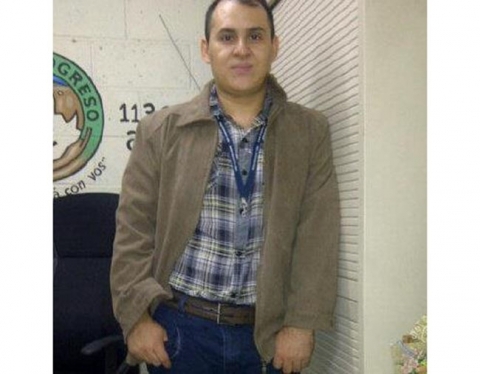 “We are shocked and saddened by the news of the murder of Carlos Mejia Orellana, journalist and marketing director of Radio Progreso in Honduras. We extend our deepest condolences to his family members, friends and colleagues. Our thoughts and prayers are with them in this difficult time.